Expired 5mo ago . Last validated 6mo ago . Used 13 times. Leng-Leng As of 10/02/18, I tested this promo code and verified that it works as described.Exclusions apply. Johanna Flores This deal was verified and it is working as described. 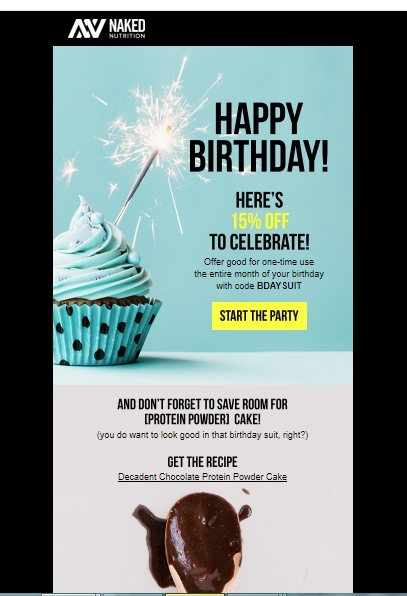 Select the items and enter the promo code <BDAYSUIT> at checkout to get 15% off your order at Naked Nutrition. Rosmary Castro I am re-activating that this deal works as described. Just type the promo code into the promotion code box and click apply to enjoy the promotion. Some exclusions may apply. eddiluz Offer valid for online orders only; not valid in-store. Add to the shopping cart the eligible items you want to purchase at Naked Nutrition, proceed to checkout, redeem the promo code BDAYSUIT on the promo code box and your order will receive 15% Off Sitewide.